Bird Problem? Bird proofing, bird prevention, bird control – we are the experts! We carry out extensive bird control work for some of the UK’s largest building companies, local authorities, retailers and architects. Based in Bradford, we work throughout the country. Although birds are beautiful creatures, they can often be a nuisance – just look at when you go to Whitby or Scarborough and the seagulls attack you and your children to get at your fish and chips! This is caused by people feeding them. 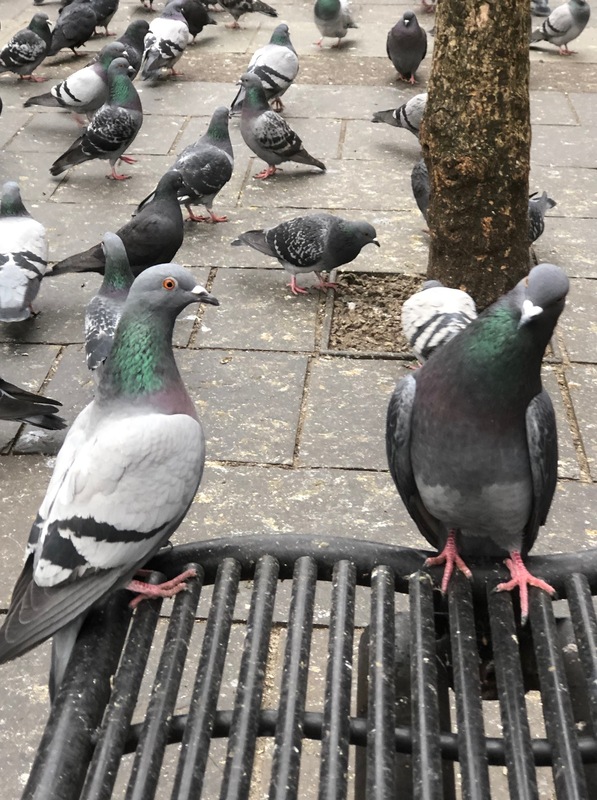 Birds in the wrong place can cause a lot of problems and that’s why businesses call us in to help with bird proofing and removal. Bird problem – why are birds a problem for your business? droppings – lots of birds will produce lots of droppings. These look unsightly on your buildings, vehicles and floors. They can also contaminate water sources and air conditioning systems. Also, they can be a slipping hazard and a hazard to any people coming in and out of your premises. 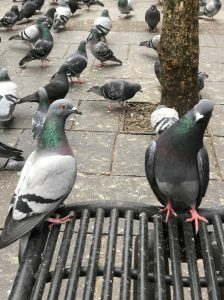 Our picture shows a flock of pigeons in Glasgow where we were working recently. As you can see, they are very unsightly, they are damaging the pavement and are a hazard to passers-by! diseases – birds can be carriers of lots of diseases, including Salmonella and E.coli. Dead birds also are a hygiene risk. noise – it can be very irritating for people in your buildings! And these are only the problems if they are outside – imagine how much worse it is when birds get inside! So how can you help yourself with your bird problem? One simple bit of advice would be ensure that your staff aren’t feeding the birds! Our Glasgow photo shows that people obviously are feeding the birds near the benches which encourages them. At seaside towns like Whitby and Scarborough, you get aggressive seagulls because people feed them, and they associate people with food. These are a major problem at the moment and local authorities are trying ways of dealing with them. This link shows that Scarborough Council is taking the problem seriously – https://www.scarborough.gov.uk/seagulls . At a local industrial plant, they had problems with grey geese preventing people from getting out of portacabins, by being very aggressive – because staff fed them. And these problems are much worse in nesting season when the birds have young to protect. How can Premier Pest Control help you with your bird control problem? Our technicians will advise you on issues such storing food where birds (and other pests such as rodents), can’t get to it. If you take away their food source, the birds (and other pests) will have to find somewhere else to go. We look at how to remove the birds already there, in as non-lethal a way as possible. We look at how birds and pests get in or on to the premises and advise how to prevent them doing so. This usually involves bird proofing your building and we have a lot of experience of doing this type of work, especially on high buildings. We install bird netting, spike and wire systems, electronic repellents and laser scarers. These systems do not harm the birds in any way but prevent the birds from landing and nesting. These measures should last for many years and are very effective. We can remove pest birds from virtually any building. We also remove the droppings, clean and sanitise the areas, to make a safer workplace for your staff and customers. Our electronic sanitising machines can spray all areas of a building or void, getting to all affected areas to kill harmful bacteria, germs and viruses. Another option is to remove pest birds using birds of prey that scare birds from buildings rather than harm them. Give us a call to discuss your needs and we can arrange a site survey, to look at the problems and discuss how to handle it.